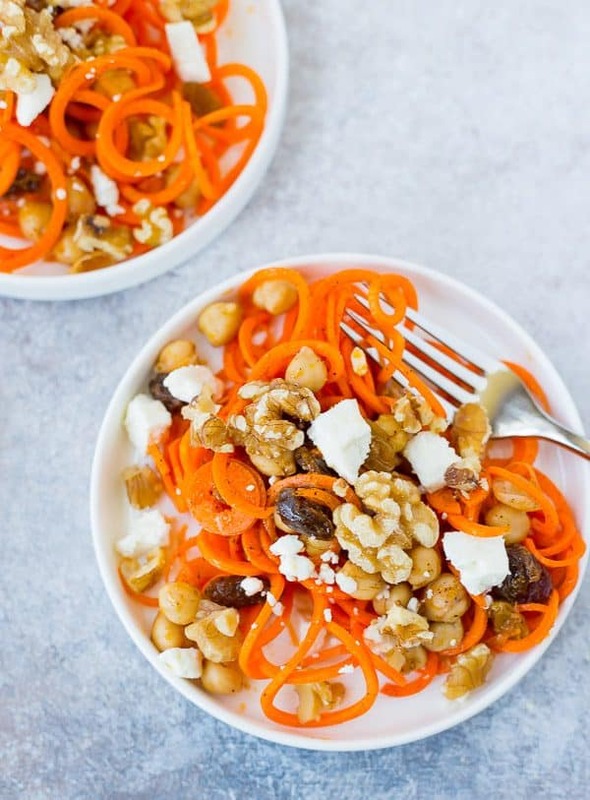 This Moroccan Carrot Noodle Salad with Chickpeas, Feta and Walnuts is flavorful, full of nutrients, and hearty enough to be a full meal! You’re going to love this one! This weekend, you guys. THIS WEEKEND. Nearly killed me. Well, that may be a little dramatic, but for real. On Friday, I had a three hour Kindergarten picnic which was fun, but being outside for that long makes my allergies go berserk. Which is annoying because I want to be outside 24/7 in this beautiful weather. Following that, we rushed home, I did a load of laundry, and got ready for graduation. If you haven’t been following along, my husband Ben is a high school principal, and this is his first year at a new (to him) high school. Graduation was also outside which was wonderful, but again…ALLERGIES. It was a smashing success (go Ben!) and he got many comments that it was the best graduation in years!! Also the first one held outside since 1989. GO BEN. Brag time over. After graduation, we went out for a drink…because YAY we survived that! Got home at 11 and the next morning drove 2 hours to go to a memorial service for someone that passed away FAR too young. I was feeling like junk the whole time but attributed it to my allergies since I had been outside the entire previous day. After the memorial service, we went straight to a graduation open house for one of Ben’s students. Came home, felt tired, but figured it was due to the whirlwind of the last 48 hours. We lazed around for a couple of hours and then I totally gave up and told Ben there was no way I was going to be able to make any sort of dinner. I bundled up on the couch under a blanket and said “Is it cold in here?” but only about 12 times, because I’m not at all annoying. My throat was absolutely killing me, to the point where I cringed every time I swallowed. Ben helped me off the couch a couple hours later to tuck the kids in and as he literally had to help me up the stairs, he commented that I felt warm. I took my temp and sure enough, it was 101.6°F. I mean, seriously. WHAT THE HECK. Adults aren’t supposed to get fevers, right? I slept like junk and woke up at 5AM (if I had even slept at all) to a 104.5 degree fever. C’mon, now!!! And of course I’m a major slacker and haven’t found a doctor in our new area yet (I knowwww, bad!). Luckily it came down a bit by morning and hovered around 100 to 101 throughout Sunday. Monday the fever was gone but here I am writing this on Tuesday and let me tell ya, I’m still struggling. Coughing nonstop, keeping myself AND Ben up at night. It’s been a blast. So now that my whine-fest is over, let’s talk about this salad. I’m going to tie this all together, I swear. I wasn’t whining just to whine. Okay, maybe I was, a little. 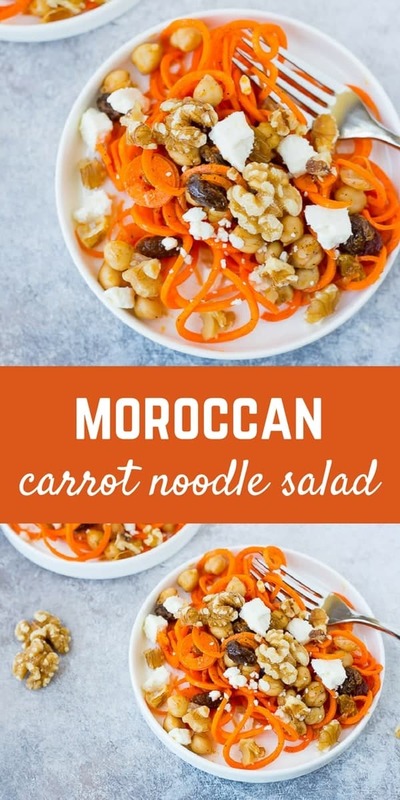 The point of all this, is that I need this carrot noodle salad. I’ve been eating white pasta and applesauce and pretty much nothing with any significant nutrients. I need this salad. But I’m just so dang tired…will someone come make it for me? My Slow Cooker Moroccan Chicken Thighs have been so popular that I decided to give you some more Moroccan flavors! This salad is perfect for meal prep (I add the walnuts and feta just before serving) and the flavors get even better as the meld together in the fridge. The raisins plump up in the dressing and are little sweet flavor bombs. There’s enough protein in it thanks to the beans, feta, and walnuts, that it makes a great complete meal; but it also performs perfectly as a side salad too. If you don’t have a spiralizer (I have this one and love it — I’ve tried three and it’s my favorite), you could also use a cheese grater (a box style grater like this one I have would work best since carrots are hard and you need something solid) or a food processor fitted with a shredding blade to shred the carrots. The salad won’t be quite as fluffy and pretty but it will be just as tasty. 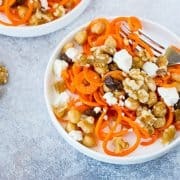 I cannot wait to hear what you guys think of this flavorful and satisfying carrot noodle salad! PS: Our challenge from California Walnuts for this recipe was to create a recipe showcasing how walnuts can be used in cuisine from all around the world. I’m dying to know — what’s your favorite way to use walnuts in global cuisine? Leave a comment and let me know! 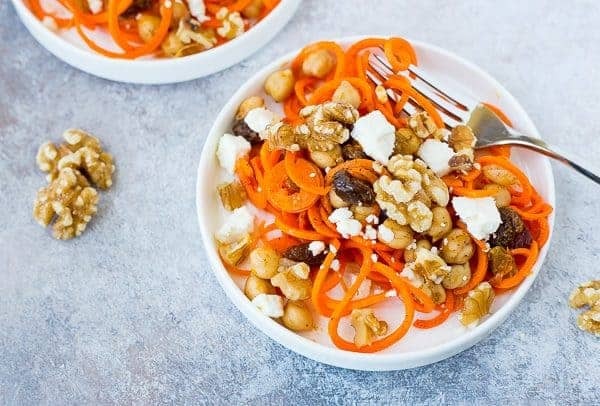 In a large bowl, combine carrot noodles, chickpeas, and raisins. In a small bowl, whisk together olive oil, lemon juice, cumin, chili powder, cardamom, cinnamon, salt and pepper. Pour over carrot noodle mixture and toss until everything is coated with dressing and spices. Top with feta cheese and California Walnuts and serve (see notes if not serving immediately). 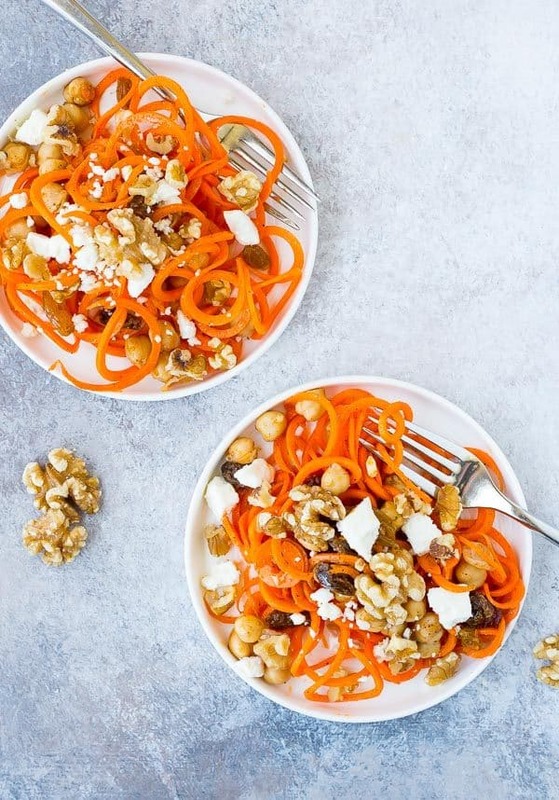 Note: If you do not own a spiralizer, you can also shred your carrots using a cheese grater or a food processor fitted with the shredder blade. 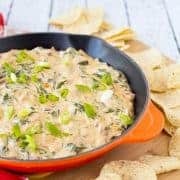 Note: I like to add the walnuts and feta immediately prior to serving to keep the feta nice and white and the walnuts nice and crunchy. 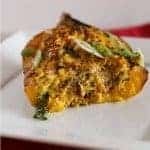 This salad does hold up well in the fridge so it’s great for meal prepping with those last minute additions prior to serving. If you’re serving immediately, feel free to mix them in. Verdict: I’ll definitely be making this carrot noodle salad time and time again. Husband’s take: Ben usually is not all about recipes where I use alllll the spices so I kind of assumed he wouldn’t love this one. His loss! But you know what they say about assuming! I was wrong — he loved it and ate it multiple days in a row. Win for Rachel and win for Ben! He’d be missing out if he didn’t enjoy this one. 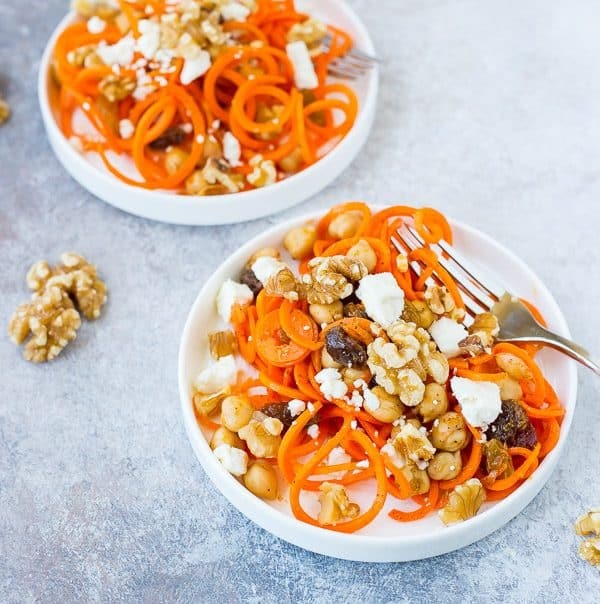 This Carrot Noodle Salad is sponsored by the California Walnut Board. All opinions are always my own. 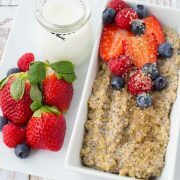 Thank you for supporting Rachel Cooks by reading about products and food I use and love in my own home.